While I probably saw James “The Amazing” Randi on TV as a kid performing some sort of magic or escape, I first really became aware of him in my early twenties when I took a college course at the University of Akron called “Lost Tribes and Sunken Continents” that taught critical thinking about paranormal claims (i.e. stuff likes psychics, ghosts, UFOs, etc.). In this world, Randi was one of the key figures, debunking psychics, faith healers, poltergeists, and the like with his knowledge, based on years in the illusion biz, of how the human mind can be tricked. Whether you agree with Randi's point of view or not, it's hard to deny that he's led an interesting life, one that would seem perfectly suited for a film. Well, now that Randi is in his eighties, someone has finally made that movie, or rather two someones. Justin Weinstein has previously worked on the documentary BEING ELMO (as writer and editor) and been a producer of various programs on PBS, including “Nova”. Tyler Measom is a former Mormon who co-directed the documentary SONS OF PERDITION (with Jennilyn Merten). 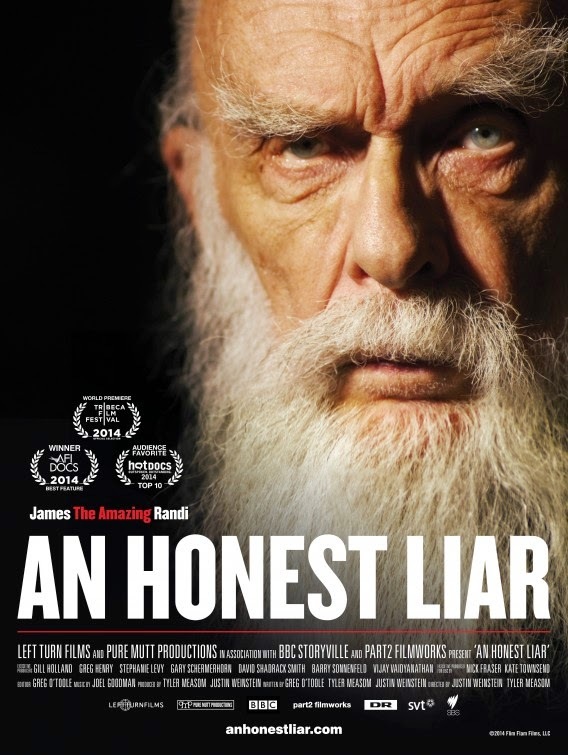 The two teamed up to tell Randi's story in the new documentary AN HONEST LIAR, and in the process found there was even more to that story than they expected. AN HONEST LIAR is currently making the rounds of the festival circuit and playing other select dates, including a couple of showings at the 39th Cleveland International Film Festival. Given my interest in the subject, I reached out to the filmmakers to see if they would answer a few of my questions via email, and they graciously obliged. Cleveland Movie Blog: I've been a fan of The Amazing Randi for quite some time, and it's frankly surprising that he hasn't had a documentary made about him already, so I'm glad someone finally got around to it. What was it that made you guys decide he was the subject you wanted to tackle? Justin Weinstein and Tyler Measom: We both have very personal connections to Randi's mission of promoting scientific thinking and fighting against unfounded beliefs. Tyler was raised as a devout Mormon but in his mid-twenties realized he was being fed lies about the faith and consequently fled the church. His dissatisfaction with being deceived cause him to explore Randi, a man who has spent his entire life trying to expose deception. Justin has been a scientist as well as a documentary filmmaker and has focused on issues of belief vs. fact in some of his previous work. Randi gave us a way to communicate these issues through a charismatic and witty character who has some incredible stories in his life. Plus, look at him - he's like a mini-me version of Gandalf, just made for the camera. CMB: Outside of a few well known brother teams like the Coens or the Russos, we're used to the notion that, however collaborative a medium film may be, at the end of the day it's still the vision of one person: the director. Why share that job, and what makes the two of you a good team? JT & TM: Filmmaking is inherently collaborative, especially so documentaries. For us it was beneficial to work as a team for many reasons. We both shared the vast amount of work needed in financing, producing, directing, and shooting the film. During production, we would either both shoot with two cameras, or alternate cinematography and interviewing between us. We also both did a lot of fleshing the story out on paper and through rough cuts and working with our editor. Basically we were a two-person team doing everything unless we needed to bring on extra crew. This way we didn't have to hire DPs or sound-people most of the time and kept costs down. Creatively we could argue over different perspectives, but we always recognized when something worked or didn't. Then it's always nice to have someone to share a stiff drink with after a long day of shooting. CMB: One of the interesting things about making a documentary is, even if you start out thinking you know what the movie is going to be, things can happen while you're filming that totally change that. That certainly happened in this case. What were some of the challenges that arose because of the surprising revelations about Randi's long time companion (now husband) Jose Alvarez, and how hard was it to convince Randi to include this very personal and difficult part of his life in the film, given that no matter what he says or does about it, his detractors are sure to use it as ammunition? (He clearly wasn't so ready at one point, based on a scene you include in the film). JT & TM: Most documentaries evolve as they're being made and written & edited, even if you go into it knowing exactly what you want. Ours is certainly not unique among documentaries for having revelations come out during the process that alter the course of the film (see CAPTURING THE FRIEDMANS, or THE OVERNIGHTERS for a more recent example.) During the initial shock of what happened it was tough for all of us. Sometimes it's a natural reaction to try to hide something, but with a little time and thought Randi and his partner realized that there was no need to hide anymore and that they trusted us to tell their story honestly. He stands for truth, even when living up to that might be difficult. His detractors will find something to attack in any case so he can't live in fear of them. CMB: There are so many interesting aspects of Randi's life that you easily could have shaped the documentary a number of different ways and still had a great film. How did you make the decisions on what areas to give the most attention, and what areas to just touch on lightly? (Personally I would have liked a little more on Randi's time spent touring with Alice Cooper since I'm a fan of Alice as well, but I think you made the right choice for general audiences in not dwelling on that). JT & TM: There are at least 3 more films that could be made about Randi's life, using other stories we didn't include or going deeper into other aspects we didn't pursue! This was extremely difficult, because there are some incredible tales and events that we really wanted to include. In the end the most important question becomes: Does it make the film better as a whole? There were things that would have been fun or interesting had we put them in, but they would have taken the story on a tangent and the overall film would lose focus. We chose to center the film on the issues of truth and deception, and that guided how we made decisions. CMB: Going in to filming, did either of you have strong opinions on the paranormal one way or the other, and did making the film affect those beliefs at all? JT & TM: Neither of us had any strong beliefs in the paranormal going into this. Tyler had given up his belief in the magic powers of Mormon underwear and all that goes with following that faith - but he still retained a strong interest in the theme of belief. Justin is fascinated with how people come to believe in things contrary to actual evidence and understands the attraction of fortune tellers, ESP, religion, and anything "supernatural," but he relies on the scientific method for determining what's real or not. The human mind can experience things and come to believe in things that are not real in an objective sense. We, like Randi, are open to accepting any type of paranormal or supernatural phenomenon is it can be shown to exist by accepted, repeatable scientific observation. We'd love it if supernatural phenomenon were discovered! But there are those who argue that the paranormal cannot be measured by scientific methods, though ultimately we feel that's just a way to defend a belief in something that cannot be proven. CMB: I was very surprised to see that Uri Geller agreed to be interviewed for the film. How did you convince him to participate? And how did Randi feel about having his old nemesis commenting about him in his own documentary? CMB: Was there anyone you wanted to get an interview with, perhaps [parapsychologists] Puthoff and Targ, who wouldn't agree to be filmed? JT & TM: No, we were fortunate that everyone we wanted to speak to was happy to be included. We didn't try to speak to Puthoff and Targ. We thought about it, but didn't feel it necessary, especially since their beliefs haven't changed and they still hold that Geller has these powers. CMB: What's the main thing you hope people take away from your film? JT & TM: We’ve been very pleased that the film has introduced thousands of people to James “The Amazing” Randi and his mission. We hope that everyone will question the evidence underlying their beliefs and be open to changing what they believe in to fit the facts, not change the facts to fit their beliefs.